Ribosome display is an in vitro protein evolution technique used to identify proteins which bind strongly to a target. Other methods similar to this technique include phage display, mRNA display, yeast display, and bacterial display; however, ribosome display provides several advantages. Why is ribosome display used? Ribosome display can be used to study the protein-protein interactions that occur during everyday metabolism. 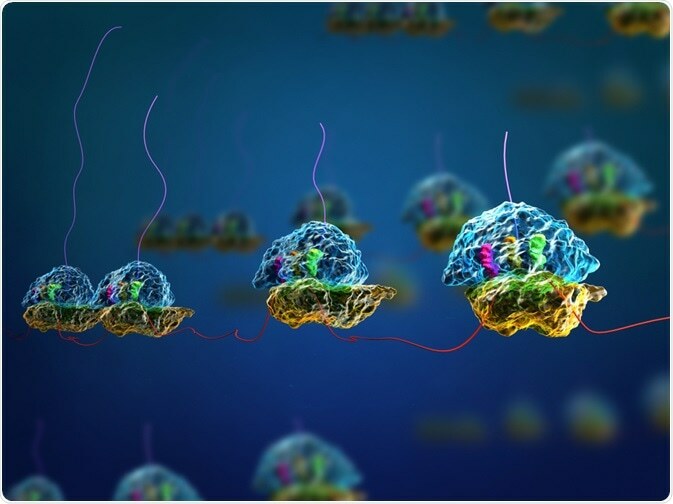 In addition, the technique allows scientists to identify the proteins and antigens present in certain diseases, develop new drugs to block pathways in the body, and understand how proteins interact in normal biological systems. A fundamental requirement behind ribosome display is the access to a large library of DNA sequences that encode proteins. These sequences are transcribed and translated in vitro, but the stop codon of each gene is removed. The end of the gene is attached to a spacer sequence, a short section of non-coding DNA. This allows the translation of the gene into the protein product using the ribosome, whilst keeping all of the components together. The absence of a stop condon means that at the end of translation, the ribosome complex cannot disassemble in the absence of the stop codon. The mRNA, ribosome and protein all stay stably attached due to magnesium ions and a low temperature. A technique called affinity chromatography is then performed, using a protein of interest bound to beads in a column, and then running over the samples from the transcription and translation of the DNA library. If any of the proteins from the DNA sequences have affinity for the protein of interest, they will be bound and retained in the column. They can then be eluted and the mRNA is reverse transcribed into cDNA and amplified using PCR. This cDNA can undergo mutations. Ribosome display is then carried out on this modified DNA, with a bigger selection pressure, to produce a protein that has higher affinity to the protein of interest, leading to selection for strong binding. The major advantage of ribosome display is that it links the genotype and the phenotype, with the mRNA being bound in the same complex as the protein it codes for. This allows easy amplification with PCR following identification of the protein. In addition, ribosome display does not rely on the ability of a cell to be transformed, as in other techniques. It is therefore simpler and less complex, requiring less steps. This method also allows easy mutation of the selected DNA sequences, as the original library does not need to be altered. Designing proteins which bind strongly to other proteins like receptors can potentially lead to the development of inhibitors or stimulators that can influence many pathways and stop disease onset. For example, antibacterial peptides that display activity against the bacterium Salmonella typhi, which causes typhoid fever, have been discovered using ribosome display. The polypeptides that are found on the exterior of Staphylococcus aureus have also been identified by ribosome display, providing new avenues for the development of antibiotics. Ribosome display is an important mechanism in protein evolution, and can improve the binding strength and stability of antibodies. Antibodies have been produced that have a 40 times stronger affinity compared to the original antibody. This can further the understanding of the interaction of antibodies with cancer markers in a cell. Nanoparticles are powerful medicinal tools used in diagnostics and as a carrier of drugs and other biomolecules. Target-binding ligands are needed in these particles, and they can be designed by ribosome display. In vitro protein evolution and ribosome display are therefore becoming ever more important as medicinal technologies develop.